This SDK is designed for the ZTEX FPGA Boards, but also works with other EZ-USB based hardware. The SDK consists in a Firmware Development Kit for EZ-USB FX2 and FX3 devices, a Java API for development of the host software, utilities and many examples. The package is Open Source and can be used under different licenses. A unique macro approach allows to configure the USB endpoints by just a few macros commands. These features distinguish the ZTEX SDK from the products of competitors. The SDK runs under Linux and Windows (X86, 32 and 64 Bit) and allows to develop platform-independent host software using a Java API. 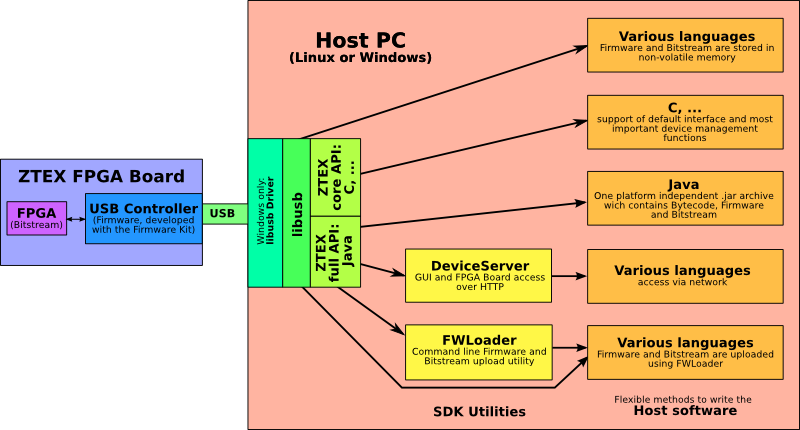 The following diagram gives an overview about the usage of the different components of the ZTEX SDK. Is written in C and requires SDCC compiler. Firmware is assembled using the powerful macro processor bmp which allows to specify all required settings by a few macros. The necessary USB descriptors, the descriptor handling routines and USB setup routines are generated automatically. Is written in C and requires the Cypress SDK including the GCC compiler. Firmware is assembled using the standard C macro processor CPP and allows allows to specify all required settings by a few macros. The necessary USB descriptors, the descriptor handling routines and USB and DMA setup routines are generated automatically. Allows platform independent host software. If Firmware and Bitstream are stored in non-volatile memory (using FWLoader or the DeviceServer) the ZTEX API is not required. In this case (almost) any programming language and USB API can be used. The DeviceServer allows to access the FPGA Board through a simple socket interface. Neither ZTEX API nor USB API are required. This method even works with simple script languages. The Host software can call FWLoader to upload Bitstream and Firmware. Almost any programming language and USB API can be used for this.